Simplicity and ease make fruit fasts a favorite. A popular form of fasting is fruit fasting, ingesting only fresh, raw fruits. This is a good fast for beginners, especially the one-day fruit fast. It offers some choices as to the fruit to use, and like all fasts, you can create your own specific routine. A fruit fast, like any of the fasting methods, will create an environment for your body to heal. You will experience an internal cleansing as the body's systems begin the housekeeping they've been unable to do before. Toxins stored in the tissues will have an opportunity to be flushed out. This detox will come with symptoms resembling the flu. Headaches, nausea, diarrhea, sore throat, coughing, fatigue, body odor, body aches, and sinus discharge are all considered normal reactions during a fast. If you find yourself with any of these side effects, take heart! and know they are a sign that your body is healing. Does the sugar content of fruit concern you? Don't let it. Fructose, the sugar in fruit, is slowly broken down and converted by the body through several complex processes, into sucrose and glycogen, supplying energy over a long period of time. Fruit is actually recommended for many with sugar-metabolizing disorders, such as hypoglycemia. On the other hand, sucrose, or refined sugar such as table sugar, assimilates and enters the bloodstream much more quickly, supplying quick energy that depletes just as quickly, leading to those sugar highs and lows and stress on the pancreas. One-fruit fasting is a type of mono-diet or one-food fasting where you stick to one fruit for the duration of your fast. 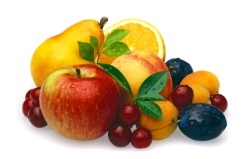 The most "cleansing" fruits are recommended -- apples, grapes, and citrus. I first did a citrus fast back in 1985 at Kripalu Center for Holistic Health (see Rice Fasting for more on Kripalu). It was a three-day fruit fast, with one orange for each of my three meals each day. Two oranges at a meal was considered acceptable if you felt you needed it. At the time I remember being concerned because orange juice (from concentrate) on an empty stomach used to give me a stomach ache, but it turned out that fresh oranges did not. I believe it has to do with the pasteurization process killing all the enzymes in commercial juices. I did just fine, so if you have the same concern, try experimenting a little before ruling out a citrus fast. Ayurvedic medicine says 3-5 day fruit fasting enhances nervous system function and aids memory. These days, I find apple fasting to be the easiest fast to accomplish. Premeasured, in a neat package, you can eat it right off the core if need be (although I do cut mine), tasty, full of fiber (good for the bowels), it allows you to chew (unlike water or juice fasting), and apples are good in all parts of the country (unlike oranges, for example). 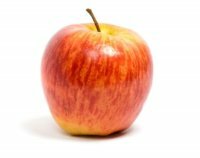 Sometimes called an apple cleanse diet, see here for complete instructions for one to three day apple fruit fasting. One of the best fasts for a first-timer is a one-day one-fruit fast. You can learn a lot about yourself and your body with a one-day fast. Without too much discomfort, you can do a couple days' worth of preparation prior, by eliminating the heaviest and most processed foods you usually consume. This will help you get more out of a short fast. The second method of fruit fasting is the any-fruit fast which says any fruit is ok, as long as all you eat is raw fruit. Grapes, apples, mangoes, bananas, citrus, melons and any other fruit you enjoy is fair game on this kind of fast. Melons, it is usually recommended, you eat alone as they don't combine well intestinally. While bananas are ok, they are starchy and considered not as "cleansing" in nature, and therefore, possibly not as beneficial as other fruits. As stated above, citrus, apples, and grapes are the most cleansing. While this is a popular fasting style for many, others find the many fruit combinations don't digest well together; such as acid and sweet fruits, as well as the melons that don't pair well with anything. Keep combinations to a minimum, and eat melons and citrus by themselves. Not strictly limiting quantities can lead to "fruit feasting". Watch your portions and eat slowly with an intention to notice when the feeling of fullness sets in. Don't go beyond this point. You might be surprised at how quickly you are actually physically satiated. It is suggested you read Know the Precautions to Fasting to become familiar with those concepts. Organic and/or locally grown fruit is, of course, the preferred choice for fasting. But since that's not always available, use the highest quality fruits you do have available. See here for a seasonal fruit chart to help plan your fruit fast. Some fruits are considered safe to consume non-organic, see here for the EWG's findings. Fruit fasting is easier and more comfortable in warmer months or warmer climates. For the winter, try Rice Fasting. Avoid eating on-the-fly. Give conscious attention to your mealtime. Just because it's a small meal doesn't mean it deserves any less attention. Actually, you are apt to feel fuller if you remain conscious of and focused on the sensations of eating. For either citrus or apple fasting, consume 1-2 fruits per meal, preferably just one. What works for many is to plan on 4 fruits total for the day. Preparation - Eat fewer and lighter meals for a couple days prior. The length of preparation is based on the intensity and length of your planned fast. The longer and/or more intense the fast, the more days of preparation you should make. For a one day fast, you can just eat a light dinner the night before. If you drink caffeinated beverages, wean yourself off during the few days prior to your fast and you'll avoid the withdrawal headache. Water - Drink at least 2 quarts of water. Fresh squeezed lemon may be added to your water, as it not only imparts a bit of flavor, but will contribute living beneficial enzymes. Activity - Plan for a light workload during a fast. Don't overdo. Moderate exercise is ok, even helpful, but save the more strenuous workouts for another time. 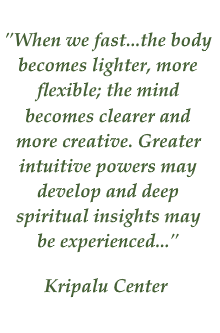 Walking and yoga are particularly well-suited to fasting. Aid Detox - Take time to do dry skin brushing to enhance the body's ability to detox through both the skin and the lymphatic system, as well as breathing exercises to help cleanse the blood. Rest - Get plenty of rest -- allow yourself naps during the day if you ever feel the need. Tips - Read the Water Fasting Tips page as most of the information there can be helpful during any type of fast or cleansing diet. Colon Health - Many recommend enemas during any kind of fast, but it isn't necessary. If the bowels don't move for the duration of your fast, that's ok. The bowels will move when you resume intake of regular foods. You can add the psyllium cleanse to your routine by adding 1-2 tablespoons of psyllium husks (available in most pharmacies, in the laxative section) to a glass of water. Do this one or two times per day. Psyllium is a natural fiber laxative that is excellent for cleansing the intestines. Be sure to drink plenty of water with psyllium as the package will tell you. Or see here for a colon cleanse recipe that utilizes psyllium. Or here, for other colon cleansing options. Breaking the Fast - Give special attention to the breaking of a fast. Do so slowly, easing back into regular foods (but making better choices about which foods!). Again, the length and intensity of the fast performed will dictate how many days you take to re-acclimate your body to regular eating. For a 10-day fast, three days of easing back in is recommended, eating normal foods on the fourth day. For a one to three-day fast, spend about a day or a day and a half taking it easy with foods. See the Guidelines for Breaking a Fast page for information on the order of re-introduction of foods, quantities, and frequency. And for a cautionary tale about how NOT to break a fast, read about Nita's experience at On Breaking a Fast Well. After the fast - Pay attention to the subtle signals from your body as they can guide you to the foods most appropriate for your needs. Check out the Recipe Section of this site for ideas. How long should you fast? Discover what length of time is best for you and how much preparation is required. Who Can Fast? Not everyone is a good candidate for fasting. Certain conditions prohibit fasting. Why you shouldn't take Supplements During a Fast. True Hunger is the signal to break a fast. Learn what it is and how to identify it, as well as other signs to break a fast. Liquid Fasting lists some of the options for doing a liquid-only fast, including broth and milk.